Be sure you know what size (height and width) you need before heading to the retail lot. If you want the same species you know or have always used, great. If you want to try a different species, browse the NCTA website realchristmastrees.org to become familiar with the species popular in your area before heading to the retail lot. Often, a tree obtained soon after its arrival on the retail lot will be very fresh because it was cut recently. Consumers should ask the retailer when he/she gets the trees: are they delivered once at the beginning of the season, or does he/she obtain several shipments during the season. Do a freshness test on the trees. 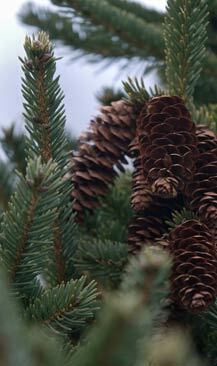 Green needles on fresh trees break crisply when bent sharply with the fingers -- much like a fresh carrot. 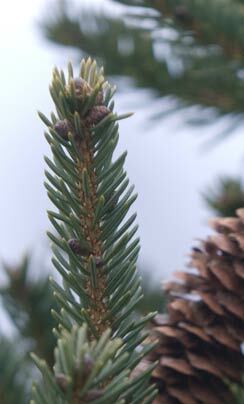 Pines have different indicators because of the fibrous nature of their needles compared to firs. The needles on fresh pines do NOT break, unless they are very dry. Look for other indicators of dryness or deterioration: excessive needle loss, discolored foliage, musty odor, needle pliability, and wrinkled bark. A good rule-of-thumb is, when in doubt about the freshness of a tree, select another one. If none of the trees on the lot look fresh, go to another lot. Some species last longer and remain fresh longer than others in different climates. Ask your retailer which tree performs best in your climate. Remember, the Christmas trees purchased from local Christmas tree farms are as fresh as a Christmas tree can ever be. What decorating theme will be used? Some species have more open foliage, stiffer branches or longer needles. Research the characteristics of the different species on the NCTA website www.realchristmastrees.org, then find a farm near you that has the species you are looking for. Go to the farm prepared for a day in the country. Wear comfortable shoes and old clothes. Bring rain gear if the weather is threatening. The "cutter downers" and the "loader uppers" should also have gloves. DON'T FORGET THE CAMERA. It's best to leave "Rover" at home (many farms will prohibit pets). But, if a pet is allowed and must come along; keep him on a leash at all times. Please don't let him "mark" other people's trees. Saws are usually provided by the farm operator. Check ahead of time. In the fall of the year ALL conifers drop, or shed, a certain portion of their oldest needles. This is a normal part of the life cycle of the tree. This phenomena occurs because the tree is preparing itself for winter. Most farms provide shaking, or blowing, services so that you will depart with a perfectly clean tree. Follow NCTA's tips for caring for a Real Christmas Tree, and keep in mind that the freshness of a tree you just cut is greater than that of one from a retail lot. Trees from the Choose Your Own farm won't absorb as much water initially as other trees because it has not had time to dry out, unless you don't put it into a water holding stand right away. Source: National Christmas Tree Association and your local Christmas Tree professional.